Recombinant fragment within Human ABCD1/ALD aa 650 to the C-terminus. The exact sequence is proprietary. 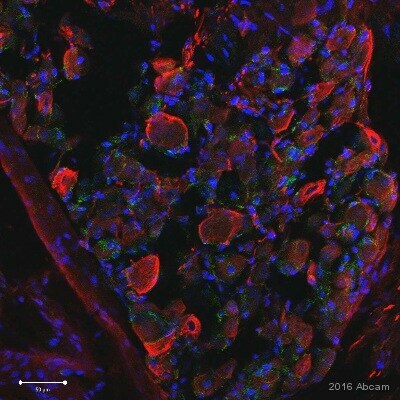 HeLa, HepG2, C6, PC-12, NIH/3T3, JAR and RAW 264.7 cell lysates; Human fetal liver tissue lysate; MCF7 cells. Our Abpromise guarantee covers the use of ab197013 in the following tested applications. WB 1/10000. Detects a band of approximately 83 kDa (predicted molecular weight: 83 kDa). Defects in ABCD1 are the cause of adrenoleukodystrophy X-linked (X-ALD) [MIM:300100]. X-ALD is a peroxisomal metabolic disorder characterized by progressive multifocal demyelination of the central nervous system and by peripheral adrenal insufficiency (Addison disease). It results in mental deterioration, corticospinal tract dysfunction, and cortical blindness. Different clinical manifestations exist like: cerebral childhood ALD (CALD), adult cerebral ALD (ACALD), adrenomyeloneuropathy (AMN) and 'Addison disease only' (ADO) phenotype. Note=The promoter region of ABCD1 is deleted in the chromosome Xq28 deletion syndrome which involves ABCD1 and the neighboring gene BCAP31. Immunofluorescent analysis of 4% paraformaldehyde-fixed, 0.1% Triton X-100 permeabilized MCF7 (Human breast adenocarcinoma cell line) cells labeling ABCD1 / ALD with ab197013 at 1/100 dilution, followed by Goat anti-rabbit IgG (Alexa Fluor® 488) (ab150077) secondary antibody at 1/500 dilution (green). Cytoplasm staining on MCF7 cell line is observed. The nuclear counter stain is DAPI (blue). Tubulin is detected with ab7291 (anti-Tubulin mouse mAb) at 1/1000 dilution and ab150120 (AlexaFluor®594 Goat anti-Mouse secondary) at 1/500 dilution (red). -ve control 1: ab197013 at 1/100 dilution followed by ab150120 (AlexaFluor®594 Goat anti-Mouse secondary) at 1/500 dilution. ab197013 staining ABCD1 / ALD in the human cell line HeLa (human cervix adenocarcinoma) by flow cytometry. Cells were fixed with 4% paraformaldehyde and permeabilised with 90% methanol. The sample was incubated with the primary antibody at a dilution of 1/70. A goat anti rabbit IgG (Alexa Fluor® 488) at a dilution of 1/2000 was used as the secondary antibody. ab197013 has not yet been referenced specifically in any publications. Publishing research using ab197013? Please let us know so that we can cite the reference in this datasheet.